The Polystone 'Mammoth' Plate is available in two large sizes, (<70cm> and <90cm>) and will sit majestically on any hard landscape. 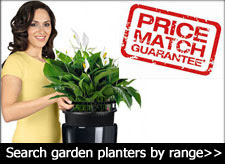 For best results mass plant with bulbs or your favourite annuals to create an eye-catching display. Purple colouring flowers work well against the off white finish of the 'Mammoth' plate, Lavandula and Salvia being the obvious choice. Please measure up. The Extra Large is approx 3ft wide! 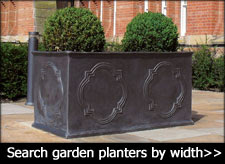 All of the polystone planters in the 'Polystone planters' range are frost and UV resistant. Polystone is easy to maintain. To clean the white planters simply wipe down with a damp cloth and warm water. To clean the black planters wipe down with a damp cloth and warm water - to create a gloss finish apply a thin coating of boiled linseed oil with a brush. Stock and Delivery In stock. Est delivery 2-5 days. 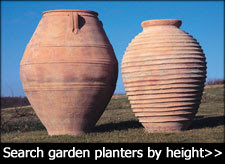 This aside, these are extremely well made garden planters and rather unique. Rob, our gardener has created a wonderful display that now sits at the front of our property. Be aware, you will need to request drainage holes as we did as there is no option to do this when you check out. 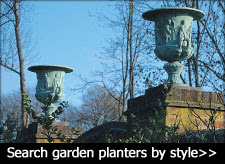 This is the third time that we have used Riverhill Garden Supplies and they come recommended.